The debate over Venezuela’s role in the trade bloc comes as new conservative, market-friendly governments in South America are at odds with Mr. Maduro’s socialist policies and crackdown on opposition dissenters. Mercosur members Brazil and Argentina led a recent effort to block Venezuela from taking its turn as the trade group’s rotating leader. Mercosur’s full members are are Argentina, Brazil, Paraguay, Uruguay and Venezuela. Bolivia, Chile, Peru, Colombia, Ecuador and Suriname are associate countries. Barring an unlikely 180-degree turn by either the four founding countries (Argentina, Brazil, Paraguay and Uruguay) or the Bolivarian Republic, MERCOSUR will strip the B.R. of V of any voting rights in the organization (it would still have a voice) over its refusal to adopt the group’s legal framework. And neither side is in a mood to back down. The Foreign Ministers of Uruguay and Paraguay agreed that unless Venezuela changes its mind, the decision reached by the four other members back in September will go forward. The impasse in MERCOSUR is not new: since it was admitted to the bloc back in 2012, Venezuela has been a divisive presence in the organization. The country has refused to accept any responsibilities or adapt its institutional framework in anyway while expecting to reap all the benefits. At the same time, Caracas has tried to shift the group’s trade-centered raison d’etre into a more political one. Venezuela got away with it in part thanks to the loyalty of Cristina Fernandez de Kirchner and Dilma Rousseff, but after the election of Mauricio Macri in Argentina and the long impeachment process in Brazil, Mercosur became a deeply lonely place for the Bolivarian republic. This step is the right thing to do. I don’t expect that Maduro will change his ways; to the contrary. The Vatican confirmed in a letter sent in August it was prepared to help facilitate dialogue between Venezuela’s ruling party and forces opposed to the presidency of Nicolás Maduro. the fact remains that any “talks” will favor the regime, since it buys it time. Once the Vatican-approved “talks” (much like the Cuba-U.S. easement, and the FARC-Colombian government negotiations) start, the opposition would be pretty much coerced into continuing “talking”, regardless of the referendum time frame. Not that you could afford much; A Dozen Eggs Cost $150 As Hyperinflation Horrors Hit Socialist Utopia. Argentina, Brazil, Paraguay and Uruguay agreed late Tuesday to give the Venezuelan government a Dec. 1 deadline to meet Mercosur’s rules to qualify for the post. Meanwhile, the presidency will be filled by an interim team from the other member states, the four countries said in a statement. Venezuela’s government is becoming increasingly Khmer ‘Rouge’. Not Castro-Communist, the oppressive weight of the old bearded godfather stifling any dreaming, thinking, reading; any activity, economic and other. A protracted standstill, a nation sitting on the curb, aging. Boredom – with intermittent bouts of starvation, sporadic violence only. But nothing for the newspapers, right? Not Stalinist either – a massive organized purge amid exalted acts of national defiance; exceptional universities and great gulags; majestic theaters and prodigious prisons – astronauts and athletes, philosophers and physicists – and slaughter. Nor is it really Maoist – the planners’ great leaps forward into starvation. These were the dreams of Hugo Chavez’s Bolivarianism. No, Nick Maduro’s Venezuela is decidedly ‘Rouge’ – the glorification of ignorance, stupidity; a warden-government turning the lights out on a civilization. 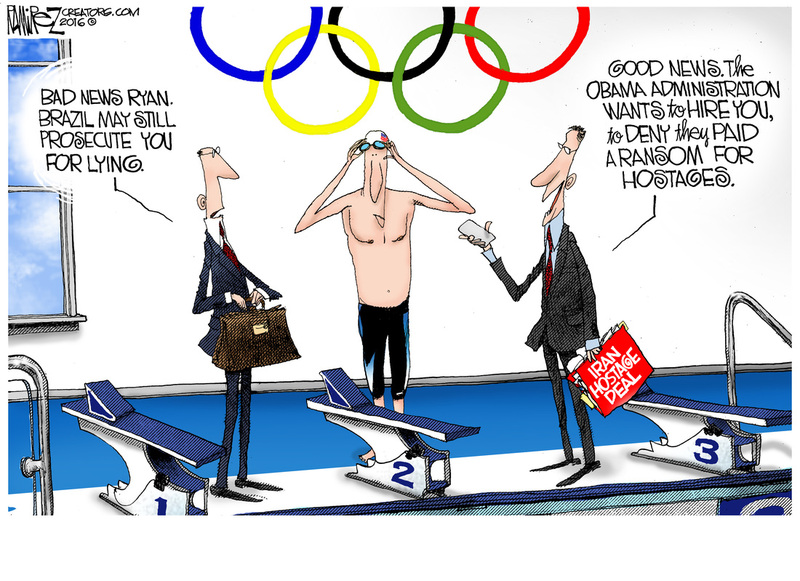 The big all-over-the-world stupid story of the week: Ryan Lochte and three other swimmers got drunk and gave Brazilians an excuse to feign outrage over their country being embarrassed; I’m still waiting for the Brazilians to be embarrassed over the body parts washing on shore during the Olympics or over the six Brazilians a day who die at the hands of state security forces. Iranian Foreign Minister Mohammad Javad Zarif will tour six Latin American countries next week to “foil the Iranophobia plots promoted by Israel,” the Islamic Republic’s semi-official state news agency Fars reported on Wednesday. Zarif will be accompanied on his visit to Cuba, Nicaragua, Ecuador, Chile, Bolivia and Venezuela by a 60-member economic delegation. Unlike Ali Baba, whose entourage was only forty-strong. The Santa Cruz academy was initially inaugurated in 2011 as the “ALBA School” after the now-weakened regional alliance that includes Venezuela, Nicaragua, Ecuador and Cuba. Morales’s invitation to that event of then-Iranian defense minister Ahmad Vahidi provoked an uproar in neighboring Argentina, where judicial authorities have accused Vahidi of a role in the 1994 bombing of a Jewish community center that killed 85 people. less than 3% of robberies in Rio, and less than 8% of murders, led to criminal sentences from 2003 to 2006. Brazil summoned Uruguay’s ambassador on Tuesday after the neighboring country’s foreign minister accused Brazil of trying to “buy” its vote to block Venezuela from taking the rotating presidency of the Mercosur trade bloc. In comments to lawmakers last week that were made public on Tuesday, Uruguayan Foreign Minister Rodolfo Nin Novoa said his government was “angry” with Brazil’s attempt to prevent Caracas from leading the regional group that also includes Argentina and Paraguay. Since Brazil’s President Dilma Rousseff was suspended in May, her replacement Michel Temer has moved the country away from leftist allies such as Venezuela and toward traditional allies the United States and Europe. Argentina and Paraguay, once close allies to Caracas, have also moved to undermine Venezuela as the OPEC nation’s socialist government struggles with economic and political crises. Are New Groups Already Moving In On FARC Drug Empire? Things are getting interesting in South America. The following day in Argentina, former President Cristina Fernández de Kirchner and other officials were indicted on charges of manipulating the nation’s Central Bank during the final months of her administration. Maduro said the measures will likely last through 2017, but he did not specify if they will limit civil rights.The announcement, made with his full cabinet at his side, broadens the scope of an economic emergency decree in effect since January that was set to expire on Saturday. Growing Venezuela lynch mobs burn thieves alive. Raw Venezuela: Looter Burned Alive, While “Streets Filled With People Killing Animals For Food”. Add to that the food shortages, power outages, and medical crisis I’ve been posting about for years. And you can forget about the Chinese bullet train. Not surprisingly, rumors of a coup are on the increase. U.S. intelligence analysts are increasingly convinced that Venezuelan President Nicolas Maduro is likely to be pushed aside by members of his own socialist movement before finishing his term. The officials, who have extensive experience in the region, said that they and others in the intelligence community increasingly believe that President Nicolás Maduro could be removed from office, either in a “palace coup” led by associates close to him or in a military uprising. They said that the possibility of an overthrow or street violence is of concern to American officials, who want to avoid anarchy in an oil-rich country just a three-hour flight from Miami. If Brazil goes against Venezuela it is likely that Uruguay will follow and Mercosur will be unanimous in its condemnation. Once Peru election is held in June even Unasur would go against Venezuela (and the recent hurried support to Dilma by Unasur secretary, the highly discredited puppet Samper, betray that worry).Thus the time for Castro to give the order to Maduro, and/or the narco-military to take the initiative to dissolve the national assembly once and for all is now. It is still possible that the OAS could fail to get enough votes to apply the democratic charter to Venezuela after Maduro acts. But once Temer decides to act against Venezuela, with the support of Macri in Argentina, the US and Canada, Mexico would follow. Small countries then will chose the big countries against a flat broke violent Venezuela and game over: Venezuela would be a pariah state and go the way of Cuba out of regional organizations. But with the narco-military still in charge. Or that is the plan anyway. And thus it is the time to act for them, the thugs, now, before Temer even has a chance to look at Venezuela. All that has been going on since last Monday points that way. What Daniel means re: the OAS applying the democratic charter is that, were the OAS to declare that Venezuela had violated it, the country would be expelled from the OAS [See OAS Democratic Charter], which would mean pariah status for the country that Hugo Chávez envisioned leading the Hemisphere. (UPDATE: See note* below). What kinds of accommodations would the new narco-military “administration” be willing to make to avoid expulsion from the OAS leads you into the realm of pure speculation. Participants at this week’s Concordia Summit in Miami, Spain’s José María Aznar, Colombia’s Álvaro Uribe and Andrés Pastrana, Chile’s Sebastián Piñera, Uruguay’s Luis Alberto Lacalle, and Bolivia’s Jorge Fernando Quiroga, discussed the failure of 21st Century Socialism in Latin America. Fifty ways to say ‘debacle’. Maduro’s term ends next year. Why should the government hurry? Cuba is getting new funds from the US, and is in no hurry to pressure Venezuela to improve. The other actors in the region (drug cartels, FARC, Iran) have no incentive to precipitate a risky change. The purpose of the regime is to consolidate power around itself, not to act in the benefit of the country. So a replacement would have to be agreeable to the Cuban-controlled military, the Cartel de los Soles, others in the power elite, the FARC, and the Iranians, while being passable enough to the OAS to prevent the country’s expulsion. And a military junta is not an attractive option, either. Linked to by the Pirate’s Cove. Thank you! Linked to by the Daily Gator. Thank you! Unasur and Mercosur are asking their member countries to sign a petition supporting Dilma Rousseff against the current investigation on charges of corruption. As you may recall, Evo Morales enthusiastically said he’ll send “his army” to Brazil, a statement that caused much hilarity (and was later officially deemed unacceptable by Brazil’s opposition). Mercosur member countries are Argentina, Brasil, Paraguay, Uruguay and Venezuela; those countries are also members of Unasur, plus Colombia, Ecuador, Guyana, Bolivia, Peru and Surinam. The big news of the week: Mexico finally released Marine Sgt. Andrew Tahmooressi, after holding him in jail for seven months on gun charges – and how perfectly timed! In avoiding its debts, the country gambles with contempt and faces the discipline of international markets. A young pioneer has declared war on the dull and colorless. You might want to reach for sunglasses. Colombia’s Farc rebel group acknowledges for the first time that its actions in Latin America’s longest internal conflict “affected civilians”. The movie star’s political manifesto is full of mistakes, misquotes, and is utterly misguided, unfunny, illogical, and unreadable. Watch the copies fly from the shelves. And what were those successes, in a country that routinely ranks as one of the least free countries on the planet? “Education for everyone, land sharing, emancipation of women, and equal rights for black Cubans.” This latter achievement would come as a welcome surprise to black Cubans, who are second-class citizens—equal only in the sense that, like all Cubans, they too have no rights. And yes, education is for everyone—provided they want to read wooden agitprop about how education in Cuba is for everyone.
. . . thorny political, economic and cultural factors have conspired against Dominican motorists. The government’s nominal motorcycle-helmet and seat-belt laws apply only to drivers, not passengers, and enforcement of speed limits and drunk-driving rules is lax. The WHO report scored its efforts in those areas just a three and a two out of ten. Less than 10% of tickets issued for vehicular infractions ever get paid, and drive-through liquor stores and alcohol sales at petrol stations expose drivers to constant temptation. Unions representing bus and taxi drivers have opposed proposed bills that could expose them to new regulation. Crisis in Mexico: Could Forty-Three Missing Students Spark a Revolution? Revolution against whom? The World Bank’s “Doing Business” global rating is not very enthusiastic about Latin American and the Caribbean which only first surfaces in position 34 out of the 189 countries considered. The Uruguayan government announces the start of registration for licensed cannabis growers as part of its plan to legalise the drug. Whatever happened to the Carnival Magic with the ebola scare? In 2014, the Pacific Alliance trade bloc (consisting of Mexico, Colombia, Peru and Chile) is slated to grow an average of 4.25%, boosted by high levels of foreign investment and low inflation, according to estimates from Morgan Stanley. MS +1.55% But the Atlantic group of Venezuela, Brazil and Argentina—all linked in the Mercosur customs union—is projected to grow just 2.5%, with the region’s heavyweight, Brazil, slated to grow a meager 1.9%. 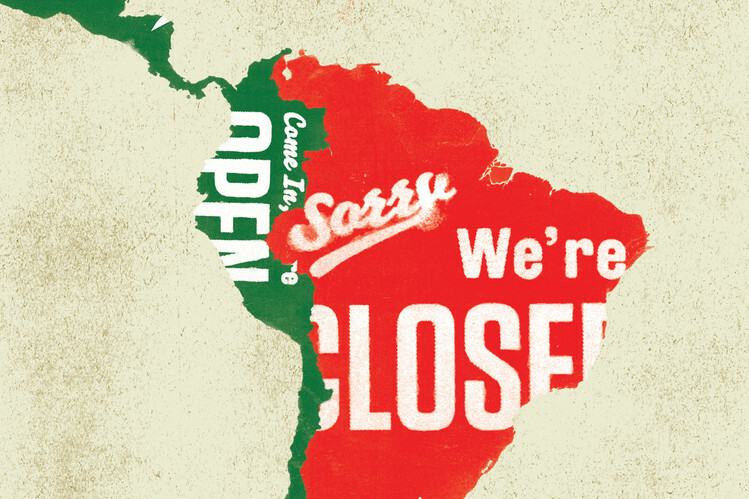 Related: Is 2014 Latin America’s “big year”? Tomorrow is election day; if you live in Princeton, NJ, please vote for me. President Kirchner’s party loses seats in four largest districts with 72 percent of votes counted in mid-term elections. Following Venezuela were Canada, Colombia, Brazil, Argentina, Lithuania, France, Italy, Spain and the Philippines, eight of which also made the top ten list last year. An 80-year-old exile wins compensation from the Chilean state over torture he suffered 40 years ago under General Pinochet, in a landmark legal battle. Is This The End Of The Chilean Economic Miracle? Colombia’s energy sector, the main driver of its economy, is limping away from “Black October,” a term coined by Marxist rebels who set forth on a month-long blitzkrieg, attacking oil pipelines, coal trains, electricity plants and transmission towers. Probably the only time I’ll post on Mr. Bieber: Justin Bieber shows Colombia´s police force is for rich and famous? Cuban authorities order the immediate closure of privately-run cinemas and video-game salons, saying they were never authorised. Biden Meets with President Mujica of Uruguay, but, did the get the munchies? Venezuela’s president, Nicolas Maduro, just unveiled the country’s euphemistically-named Deputy Ministry of Supreme Social Happiness—to mockery on Latin America’s blogosphere. What will Mercosur do about Venezuela’s delayed payments?